Note: Video is available at the bottom of the page. Well, it’s 2017! That means a fresh new start, and to celebrate that, I’m doing a 3-in-1 review! This 3-in-1 review will be on the Grid franchise. 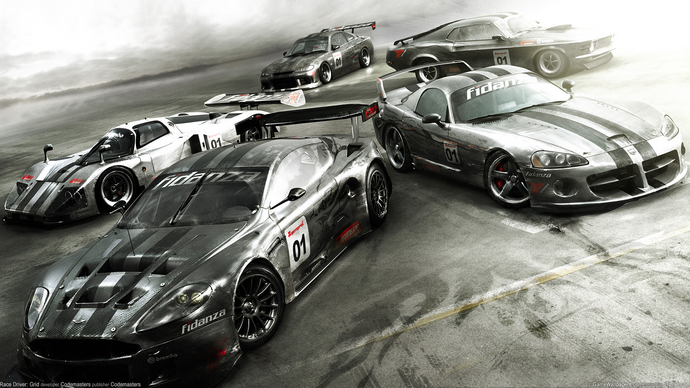 The Grid franchise consists of Grid, Grid 2, and Grid: Autosport. Today, we’re going to find out if these three are hidden gems, or shouldn’t be touched, seen, or heard about. First up is the original Grid. Grid was released in North America in 2008 by Codemasters, who are also known for creating the F1 franchise (F1 2016, F1 2015…), the DIRT series, and the Overlord series. In places outside of North America, Grid is known as Race Driver: Grid. Grid is an automobile racing game where you start your own professional racing team and race Fords, Nissans, Aston Martins, and even prototype cars! There are 45 cars to drive (either from America, Europe or Japan), and the car selection is absolutely amazing, ranging from F1 cars to destruction derby cars! You can hire teammates, earn sponsorships, create your team number, and a team design! Pretty sweet, right? I’ve asked Nicholas Sarmiento, 20, on his perspective of the car selection in the game. Brenden: Is there anything you would change about the car selection? Nicholas: Yes, if I could I would install every manufacturer with almost every race car and sports car that they’ve produced. Other than that, they have a good selection. [It’s] sorta limited though. What Nicholas means is that if he developed this game, he would have taken every single car manufacturer ever and put almost every car they’ve created in the game. Sounds like a lot of work, but it would totally be worth it! Except for one thing, the other aspects of Grid are like your normal racing game: Race against other teams, avoid losing control of your car, win championships, earn money to buy more cars, and become the greatest racer in history. Grid in some ways is like most race simulator games (take for example, Gran Turismo), including the fact that there’s barely a story. Most of the time, it’s not okay to have no story. Think about it. The Last of Us. It’s just a game about humans acting kind of like zombies and you have to shoot them. It’s not much. Tom Clancy’s The Division. It’s you walking around fighting off enemies and walking around for absolutely no reason without a story. These days, people have gotten used to games like Forza Motorsport 6 not having a story. Nicholas has a different perspective. Brenden: Do you think it’s a good thing that there’s not much of a storyline to Grid? Nicholas: No, if there were an actual storyline as to where you were introduced as an amateur racer that advanced to beat Ravenwest (more on them later), that would’ve been so cool! Like start with slow race cars/sports cars and move all the way up to LM (Le Mans) or F1 cars! The one thing that isn’t like normal racing games is the Flashback system. Whenever you spin out, mess up a drift, or wreck your car (which is very possible and common if you have no traction control during a touge and you’re drifting – believe me), you can use a Flashback (depending on your difficulty settings, you have from 0 to 5 to infinite Flashbacks. Flashbacks will rewind time up to a certain point. In the game, you can either press a button on the controller, joystick, or keyboard (depends on preset or custom control setup you have) for quick access or open “Instant Replay” in the pause menu to use Flashbacks. Nicholas really likes the idea of the Flashback system too. Brenden: Is the Flashback system a nice addition to the game and why? Nicholas: Yes, it most definitely is. In case you end up making a huge error during a race or event you may use this feature to rewind and fix your error. Grid is a very interesting game. Sometimes it’s a bit of a repetitive game, but still a good one. It’s generic sometimes, but still a good one. That’s why Grid gets an 8.5 out of 10 from me. Next up: Grid 2, the sequel to Grid. 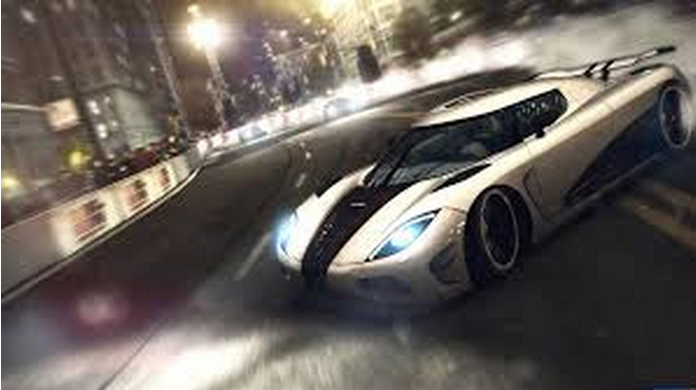 Grid 2 was also released by Codemasters in 2013. This time, you are not a professional racer with a team, but more like a street racer or a freelance racer. Instead of the same design on every car you own, you can individually change the appearance of your Honda, Chevy, or BMW with preset colors, designs and rims. The graphics are much less muddy and the animation is cleaner than the original Grid. In the original Grid, you could only buy cars with money you earn, but in Grid 2, there’s no money system at all, which is kind of weird. The way you earn cars is through either unlocking a new category of cars or a new tier of them, or through Vehicle Challenges. Vehicle Challenges show up every once in awhile, but when they do appear, you have to complete a track in a certain amount of time (basically complete a time trial) to earn a car. It’s interesting, but not the greatest way to earn cars. Buying the cars yourself is much better because there’s much more challenge in gaining the money to buy it instead of just driving the car across a mountain for 2 minutes to win the car for free. Besides, in Grid 2, it’s way too easy to beat Vehicle Challenges. There’s actually a bit of story behind Grid 2. Grid… eh, not so much. In Grid 2, your partnered with Patrick Callahan, who wants to set up a racing series known as WSR, or World Series Racing. Your job is to spread the word by racing famous drivers in places like Chicago, Hong Kong, and even here in California! WSR introduces a new innovative race event. It’s like a normal circuit race, but every single lap the course changes. You can never memorize the track because it’s always changing from twists and turns to straightaways! That’s a really intriguing twist Grid 2 has pulled on circuit races. As well as the new circuit races, Grid 2 has also pulled something off with sprint races! It’s a timed sprint race, except when time’s up, whoever’s driven the farthest wins. Crazy that Grid 2 is so innovative, right? Grid 2 in the end is a quite well-made, innovative game. It’s pretty, it sounds great, and it made a great addition to the series. Hopefully Grid: Autosport’s like this. Grid 2 gets an 8 out of 10. Now, Grid: Autosport is starting to become more of a simulator instead of an arcade-like game, like Forza Horizon. In Autosport, you’re just your average driver signing contracts to race for teams instead of starting your own team. Autosport does something rarely seen in race simulation games: qualification. Qualification is where you either complete time trials to determine (by who got the fastest time) who’s in first (and last), or you drive in a race before the real race, and the results are the starting grid for the real race. It’s nice to see that Autosport is starting to stand out from the others. Autosport may be one of the best looking and animated games of our generation. Even when the races drag on (because believe me, they definitely do), you just can’t leave mid-race because you can’t stop looking at how great it looks! The lighting is spot-on, the draw distance is stunning, and the HUD (head-up display) is simple, modern, and beautiful. I… don’t really say that about HUDs. Speaking of perfect, most of the technical stuff is. The physics, the sound, the real rules of racing (like how if you cut corners you get a penalty – that’s taken from Grid 2)! 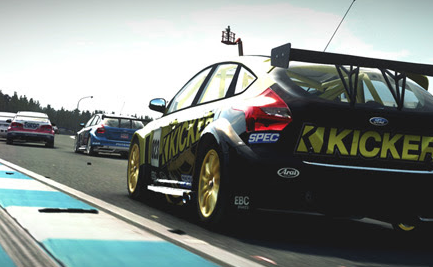 Grid Autosport doesn’t really bring too much new to the table. It’s like the original Grid, but remastered, if you will. That’s why I give Grid Autosport by Codemasters an… 8 out of 10. Overall, the Grid franchise is a hidden gem. I’m completely blown away by the fact that no one I’ve asked to interview about this game knows about it! Reader, please: do me a solid, and go buy one of these games. Any of them. If you don’t, at least spread the word, because these games are great. Hopefully you believe so too.